How do teachers, experts in education, gain a voice in the education reform movement that targets them as a problem? Tuesday’s #edchat was something different to say the least! Firstly it was invaded by ‘tech Gremlins’ (as described by @esolcourses) with both moderators experiencing twitter and connection problems. (Thank you to all those edchatters who stepped in to rescue the situation!) At first two topics were making the rounds – but things finally settled down and in true PLN-collaborative-form #Edchat forged ahead. The task of writing the summary this week has been valiantly undertaken by Jarrod Drysdale (@knackisms). Although not a teacher, Jarrod works in the field of education and technology so he gives us a bit of a birds-eye view on this topic! Thank you Jarrod for stepping up to the plate to provide the summary of what was one of the strangest #edchats to date! See Jarrod’s bio at the end of the post. While #edchat participants are frustrated with having a target painted upon their foreheads, they’re still motivated and excited to participate in education reform. Educators want to shift the conversation to the positive and work together with the community to make necessary changes. Educators desire respect and trust, and are willing to do the hard work. Conversations made clear that teachers need to get more involved with current events and focus upon the big picture rather than just the scope of their individual classrooms. In addition, educators need to better inform the public, including politicians and parents, of the challenges they face. ● Teachers need to stand up and communicate the reality of what is happening in schools. ● Change the story to focus on all the positive achievements by educators. ● Teachers need to get involved with local elections and the press. ● Trust is critical among teachers, administrators, and parents. ● Teachers face a lot of negativity in the press, communities, professional circles, and politics. ● Learning is the responsibility of students, families and educators together. ● It’s difficult to define what makes a teacher effective, but teachers are best equipped to evaluate their peers. @baldy7: #edchat if educators/teachers want to have a voice, they need to stand up and be heard. Too much being done to them! @baldy7: #edchat education is perceived as a noble field, but one that “anyone” could do. we allow the perception to exist. @Smichael920: #edchat the more parents r involved in their chdns ed, the more respect they have 4 tchrs. Mayb more politicians should spend time in sch! If you would like to join others in transforming the discussion into action, please feel free to join the Edchat group on the Educator PLN ning. Jerry Swiatek does an incredible job of posting each archived transcript on the Edchat wiki created by Steve Johnson. This way you can look back at your favorites! Find previous summaries here on this blog – see edchat category on right sidebar. 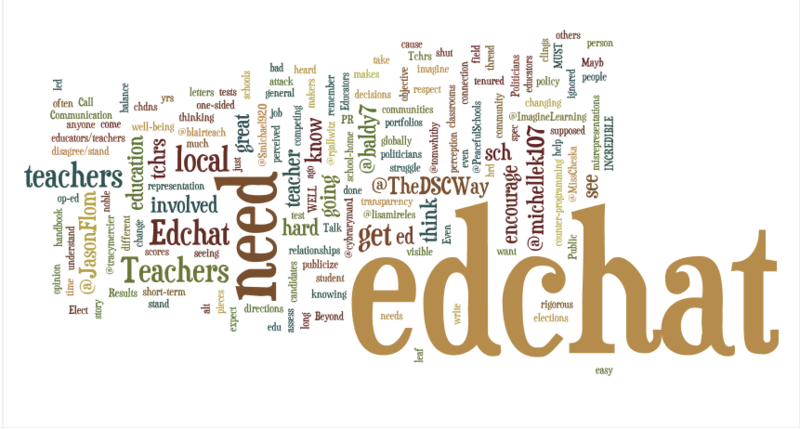 Follow other Edchatters and make sure you are on this Twitter list if you participate in Edchat! 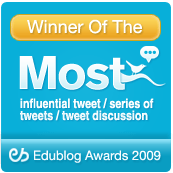 Read summaries of the 7pm EST/1 am CET Edchat discussions. Has Inclusion Been Effective? How Can We Tell? 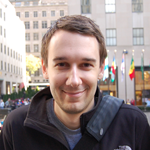 We are very gareful to Christopher Rogers (@MrR0g3rs) for this week’s #Edchat summary. It wasn’t the easiest of topics as not everyone involved in the discussion had had personal experience of this type of teaching. I think you’ll agree it’s a job well done! Thank you :-). Christopher is a regular and enthusiastic contributer to #edchat and passionate about education and the role that social media can play. See his bio at the end of the post. As inclusion programs are adopted around the world it is important for us as educators to pause and reflect upon their effectiveness. The effectiveness of inclusion programs depend greatly upon a wide range of different elements. Once again it is clear that strong school leadership is essential for success. An inclusion program must be consistent and pervasive across the district, which is an impossibility without strong school leadership. Inclusion must be just as much about philosophy as it is about pedagogy, again something only effective school leadership can create. Part of this philosophy must be an unwaivering commitment to differentiated professional development for educators so that they have the training they need to be effective. If inclusion programs are implemented haphazardly school districts risk not only robbing the inclusion student of a quality education, but all of the other students as well. There is some level of confusion about what inclusion actually is. Whether it is a matter of semantics, training or application, many of the people involved in this chat expressed confusion or disagreement about what inclusion means. For inclusion to be effective there has to be a pervasive policy that includes all school stakeholders. We need to ensure that inclusion programs are not a detriment to other aspects of the class, including acceleration for gifted and talented students. @Parentella: What about students who are excelling, but can’t go farther because teachers teach down to them? Is that inclusion? @Aaron_Eyler: Inclusion needs to be looked at as a continuum. More support for both excelling and struggling learners. @Spyder0902: Effective inclusion programs must include a common planning time and true/authentic collaboration between Gen and Sp Educators. @cybraryman1: Teachers need a lot of training if they have inclusion in their classrooms. Can’t just put these students in mainstream without it. @ShellTerrell: Do most inclusion programs prepare teachers adequately for the diversity of their learners’ skills? @rickweinberg: @tomwhitby I will be honest. As a parent, my wife has questioned if my daughter will feel different if she is in an inclusion class. @skipvia: This is another “shoehorn” solution–mandating inclusion without thinking about the overall structure of instruction. @baldy7: ok, but we need to remove the cold, clinical, terms in our work with kids. It is the first steps to changing the culture. @thenewtag: It isn’t right, but when inclusion is forced on teachers who don’t buy in, the kids lose – ALL of the kids lose. @NSRiazat: My experience has shown that sometimes some pupils don’t buy into it….even though it is there to support. @malcolmbellamy: it is about finding every child’s potential: we can do real harm if we treat children as unable or believe that they are. @MissCheska: @smapplegate Good perspective on remediation; it seems to have negative connotation for students. How to turn around? @W3iGHTLESS: Inclusion = philosophy not action it doesn’t mean ALL or nothing- it means what is best for the stdt to get the most of his/her ed. @ImagineLearning: I’ve observed programs focus on students who R closest 2 passing standards. Students far behind or ahead get less attention. @olafelch: @shyj I don’t know. My point was really that genuine conviction is equally (or more) important than training. @ thenewtag: @michellek107 We’ agree re: what SHOULD Be required. But reality is it’s not, so as a parent, I want my kid w/tchr who WANTS my kid! 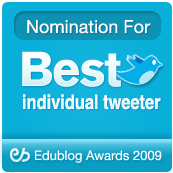 courosa: Resource for the #edchat ‘ers today – ‘In My Own Language’ http://is.gd/eB1Ix Read the description, watch the entire vid. Christopher Rogers is a Language Arts and Theatre teacher in Morrisville, NY. He is also the technology coordinator/integration specialist for his district. 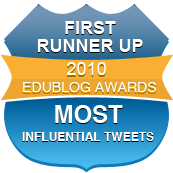 Since beginning his education blog, EdTechSwami a little over a year ago he has become very involved in the social media teacher’s movement happening all over the world. Find him on Twitter, @MrR0g3rs. Thank you to Pernille Ripp (@4thGrdTeach) for this week’s #Edchat summary. This week’s topic was one that crops up often in #edchat and one which we all like to moan about!! Pernille has done a great job in condensing and encapsulating everybody’s thoughts on this, at times tricky, relationship within education. See her bio at the end which is, I must say, very modest – Pernille is a great asset to edchat and her blog is well worth a read!! Being an avid fan and participant of #edchat, I was thrilled at first when I was asked to write this week’s summary of our noon conversation on August 17th; How can administrators better structure school meetings to be more productive? And then when I realized what the topic was my joy quickly turned to dread. After all, this was one of the most non-informative #Edchat’s I had participated in this summer. I mean, how many ways can we really change how administration schedules meetings? Besides, why would they listen to our ideas? And yet, this thought was exactly why this was a valid conversation to have, particularly as most of North America is getting ready to return to school. So I thought back to my own experience; as a novice teacher I was always excited about staff meetings, after all, these were meeting where our successes would be shared, professional development would be highlighted and stimulating conversation would be had. 3 years into teaching and I have become one of the outwardly shoulder-shruggers, eye-rollers, paper-doodlers and all around none-to-thrilled about the whole administration meeting. In fact, if you ever want to please the staff at my school you let them know that this week’s staff meeting has been cancelled. So when does this change in excitement occur? When did I go from doe-eyed meeting enthusiast to uninspired tuner-outer? Turns out that I am not the only one so jaded by staff meetings and the sort, fortunately, I am not the only one either that wishes it would change. As #Edchat has proven before; there are many of us that want to change the world; one conversation at a time. The lackluster appeal of staff meetings is not my principal’s fault; I wish it was. Then I could blame him and feel better about my own attitude towards them. It is a staff effort to kill a professional meeting. To do it you must have certain ingredients in place such as whispered conversations, lack of agenda, limited follow through, and overall stressful teaching days. I do not think that any staff sets out to arrive here, but once at this dead-end destination, those staff meetings can be hard to resuscitate. My staff went through somewhat of a revival last year, in which, more people took responsibility for our meetings and protocol was set. This was a huge step in the right direction and something many #Edchatters expressed a hope for. Now instead of getting away with bringing work, we are expected to be attentive and focused. Instead of having side conversations, we are asked to be quiet and raise our hands to participate in the topic at hand. Agendas are no longer cloaked in secrecy but rather shared and open to suggestions. Time is now honored and my principal no longer, and never did, expect us to stay beyond the 45 minutes. And yet, we are not there yet. Staff meetings are still not celebrated or heralded as learning opportunities but viewed as yet another responsibility in our already overwhelming days. In fact, this was a recurring theme in our #Edchat. Many participants asked for time limits to be set so that they knew exactly how long the meeting would last. They also asked for a chance at professional development from this time, and not from outsiders, but a chance for staff within their building to share something they were doing or learning. We often discuss how little time we have to share, why not take the time at these meetings? Many suggested keeping announcements out of staff meetings and sending them out via email instead; an idea I wholeheartedly agree with. I would rather read about the new changes at school, particularly when it is not open for discussion, rather than have someone drone on about the why’s and how’s of it all. One fantastic idea, was to create a backchannel for the meeting, whether using Facebook or Twitter, but providing some sort of means to give a running commentary while the meeting happened, much like you see happen during Elluminate presentations. This would also work as a tool to draw all staff members in and for everyone to feel valued and listened to. Although, this would be ideal for me, I am from a school where I am one of the only ones on Twitter. So to convince a whole staff to not only join Twitter, to use it, and then to use it during staff meetings can seem like a mountain of obstacles and yet it does happen in schools. How though is still being debated. So are staff meetings headed the way of the fax machine? We still need them once in a while but really do we have to meet face-to-face? I would argue that staff meetings are vital to a school’s success. It is an instant read of how engaged its staff is, as well as how the climate is. There is nothing that can beat a room full of staff members engaged in a conversation. Yet the format is clearly not a success in most schools. Many people mentioned the negative attitudes that would be brought into meetings and seemed rather desperate to quiet them. And I agree, nothing can harm the morale of a staff more than one person’s negative outbursts. The same can be said for when select few dominate the conversation, rather than making it a full staff discussion. Technology, though, does provide us with some tools to create better learning environments, as we see in our classrooms. However, just like in our classrooms we must take ownership of the meetings and create the type of environment we would like to be taught in. We ask our students to do this ,so why is it as adults that we do not hold ourselves accountable? Whether it be a back channel, a protocol or simply renewed energy; keep in mind that you are the controller of a staff meeting as far as that your energy for that meeting is replicated and mirrored by those sitting around you. So although we may feel haggard after another full day of teaching, bring that love of teaching and learning into your staff meeting and do not let other’s stop you either. One person can make a difference as we all know, and you are not alone in wanting a better environment for staff overall. Keep housekeeping items out of staff meetings and email them instead. @hblanton: Don’t read things to staff members, give them the info ahead of time, then make the meeting a dialogue with specific goals. @chris_reuter: Most effective mtgs r when teachers/kids share what is going on and admin play a 2ndary role. @TomWhitby: Admins need to employ Tech to convey Management stuff in order to cocentrate on Learning issues for F2F Meetings. @Nunavut_Teacher: My principal gives teachers the opportunity at specific meetings to present on a topic they are passionate about. Love that. @ColinTGraham: Local schools must have faced or be facing similar issues/problems. Why not set up inter-school teams to discuss/ present/share? @tomwhitby: As in a class if you engage the participants of the Mtg they will pay attention. @TomWhitby: If a tchr entered a class w/o a plan to engage and teach the class, the Admin would be upset. Should we expect less of the admin? @tomwhitby: Conducting a productive meeting should be a required skill of all admins. It needs to be modeled and taught. Does homework have a true benefit to learning? Pernille Ripp (@4thGrdTeach) is a 4th grade teacher in Middleton, Wisconsin who is constantly amazed at the brilliance of her students. Married to her soul mate who is a a closet-teacher, she continues her learning journey this year with the Global Read Aloud Project as well as breaking down classroom expectations and starting all over in a 4/5 class. She has won no awards and been given no accolades other than the lightbulb moments her students share with her every day. When inspiration hits she writes for her own blog, Blogging through the 4th Dimension and overall just loves her life.